Welcome to Heider's Berry Farm. Our land has been farmed by Heiders for five generations, starting as a typical Midwestern farm with dairy, hogs, sheep, chickens, corn, oats and hay. 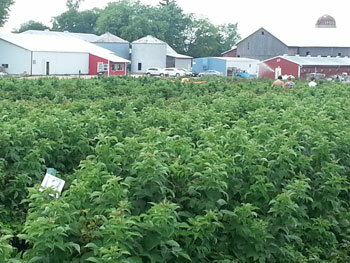 From 1972 to 1986, we operated the largest berry farm in Illinois. After 25 years of landscaping, we're back as Heider's Berry Farm, on a smaller scale, to provide quality fruit and friendly service. We invite you to spend time on our farm in Woodstock, IL. Wander into our fields to enjoy a true farm experience, all natural with no admission or parking fee. We try to get along with "Mother Nature", but the picking season may vary depending on the weather. Hot weather will cause an earlier, but shorter season and will increase supply. Cold weather will cause a later start and a longer season. Picking can usually resume shortly after a rain, and because most fields are mulched, muddy ground is seldom a problem. Be sure to check our Facebook page for current picking conditions.